Provide comfort for the family of Frank Wimmers with a meaningful gesture of sympathy. Frank Joseph Wimmers, loving husband of N. Ruth Wimmers (nee Schnitzler). Passed away Thursday February 21, 2019 with family by his side. Besides his wife of 58 years, Frank leaves behind his children, Dave Wimmers (Kim), Debbie Wimmers (Doug Fasbinder) and Dan Wimmers (Lora) as well as his grandchildren, Lynn Becker (Dan), Kevin Siemer (Lauren), Michelle Grim (Trae), Sean Ashcraft (Lanita), David Wimmers, Jenny Wimmers, James Wimmers, Darion Wimmers, Keelie Wimmers, and 8 great grandchildren. Dear brother of Charlie (Mary) Wimmers and JoAnn (Bob) Werle. Frank was preceded in death by his brothers, Nick (liv. Helen) and Fred Wimmers. 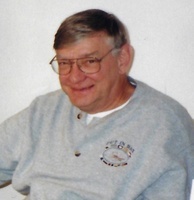 He worked for Hamilton County Family Services as a System Analyst as well as operating a tax preparation business in the Cheviot, Ohio area for over 40 years. Passed away February 21st at the age of 78. Visitation Thursday, February 28th from 9:30am until time of Funeral Mass at 10:30am at St. Martin of Tours Church 3720 St Martins Pl, Cincinnati, OH 45211. Burial to follow at St. Joseph New Cemetery. IN LIEU OF FLOWERS, please send donations to the Juvenile Diabetes Research Foundation, Greater Cincinnati Chapter 8050 Hosbrook Road Suite 314 Cincinnati, Ohio 45236. Dear family and loved ones, I was sorry to read about the passing of Mr. Wimmers. Please accept my sincere condolences for your loss. It has helped me and many others to know that the Bible promises that soon God “will swallow up death forever” (Isaiah 25:8) and that He will bring about a resurrection of our dear loved ones (John 5 : 28, 29) . May “the Father of tender mercies and the God of all comfort,” comfort you during your time of sadness (2 Corinthians 1: 3).